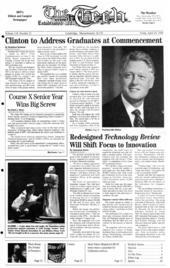 President Bill Clinton has chosen to speak at MIT's 132nd Commencement on June 5, the White House announced on Tuesday. Clinton will be the first sitting U.S. president to address an MIT graduating class. "We are honored and delighted that President Clinton has selected MIT as the place to deliver a major address to people who will be the leaders of the 21st century," said MIT President Charles M. Vest. "The future will be shaped in large measure by advances in science and technology, and MIT is the home of many of the people making those advances," Vest said. "We look forward to the president's address and his vision." Plans to have Clinton address the Class of 1998 developed over the past week as the White House finalized its plans for this year's commencement addresses by the president and vice president. On Friday, the White House contacted Vest's office to discuss Clinton's desire to speak at MIT. The president has yet to indicate any specific reasons for choosing MIT over other institutions. "Although I can think of many excellent reasons why he might choose to address MIT's graduates, only he can answer this question," Vest said. "By tradition, the president always does a military academy, a private institution, and a public institution," said White House Press Secretary Mike McCurry. In addition to MIT, the president will be speaking at the U.S. Naval Academy on May 22 and Portland State University in Oregon on June 13. The White House has characterized Clinton's speech at MIT as a "major address." This term generally implies that the speech will contain an important statement about a significant topic, Vest said. "My guess is that this will involve views or policy statements regarding science and technology, but that is speculation on my part." Clinton's offer to speak was only accepted after Vest consulted with Dr. David D. Ho, who had been invited in February to be MIT's Commencement speaker. "I am deeply honored to speak to the graduates of MIT, and even more so to share the podium with President Clinton," Ho said. Both men will address the 2,000 graduates receiving their degrees in June. The current plan is for Ho to speak first, Vest said. Ho, a leading AIDS researcher and Time magazine's Man of the Year in 1996, was chosen earlier this year to deliver the Commencement address. Because Clinton will be joining Ho in addressing the graduates and thus adding an additional element to the program, Vest will skip his usual charge to the graduates. "To maintain a strong focus on our graduates' receipt of their diplomas, I felt it was important not to devote much more time to speeches," Vest said. However, all other aspects of the Commencement exercises will remain the same. Every year, colleges scramble to obtain high-profile speakers. MIT has again managed to attract a world leader to speak at Commencement ceremonies. Past addresses have been given by Secretary General of the United Nations Kofi A. Annan SM '72 (1997), Vice President Al Gore (1996), and the Aga Khan (1994). Other speakers announced by local colleges include German Chancellor Helmut Kohl, who will speak at Brandeis University on May 24 and former Ireland President Mary Robinson, who will speak at Harvard University on June 4. Rice University will feature speaker Kurt Vonnegut, the author who was rumored to have spoken at MIT's 1997 Commencement in a speech widely distributed on the Internet last summer. Approximately 10,000 graduates, family, friends, and members of the MIT community are expected at the ceremonies, which will be held in Killian Court.